The sheet music and tin whistle notes are included. I've Waited As Long As I Can. Written by Hylo Brown and a big hit for Sharon Shannon and Dessie O'Halloran. Also recorded by Daniel O'Donnell and Mary Duff and Robert Mizzel. In the video is Gerry O'Connor playing four string banjo. Gerry is one of the top 3 banjo players in the world along with Christy Sheridan from The Bards and Barney McKenna from The Dubliners. The song started out as 'I've waited as long as I can'' by Hylo Brown, but for some reason the title got changed to Say You Love Me. But this [G]waiting no longer I can [D]stand. I [G]know you've had time, dear, to [C]make up your mind. I've [G]waited as [D]long as I [G]can. And longed for the day you'd take my [D]hand. I [G]asked again last night for your[C] love so divine. I've[G] waited as [D]long as I[G] can. Done all I can do; said all I can say. Oh, why can't I make you understand? I've wanted you for mine but I've wasted my time. For you have made it plain that I can't win. No one will ever know the pain that I've been through. But this [D]waiting no longer I can [A]stand. I [D]know you've had time, dear, to [G]make up your mind. I've [D]waited as [A]long as I [D]can. And longed for the day you'd take my [A]hand. I [D]asked again last night for your[G] love so divine. I've[D] waited as [A]long as I[D] can. But this [C]waiting no longer I can [G]stand. I [C]know you've had time, dear, to [F]make up your mind. I've [C]waited as [G]long as I [C]can. And longed for the day you'd take my [G]hand. I [C]asked again last night for your[F] love so divine. I've[C] waited as [G]long as I[C] can. 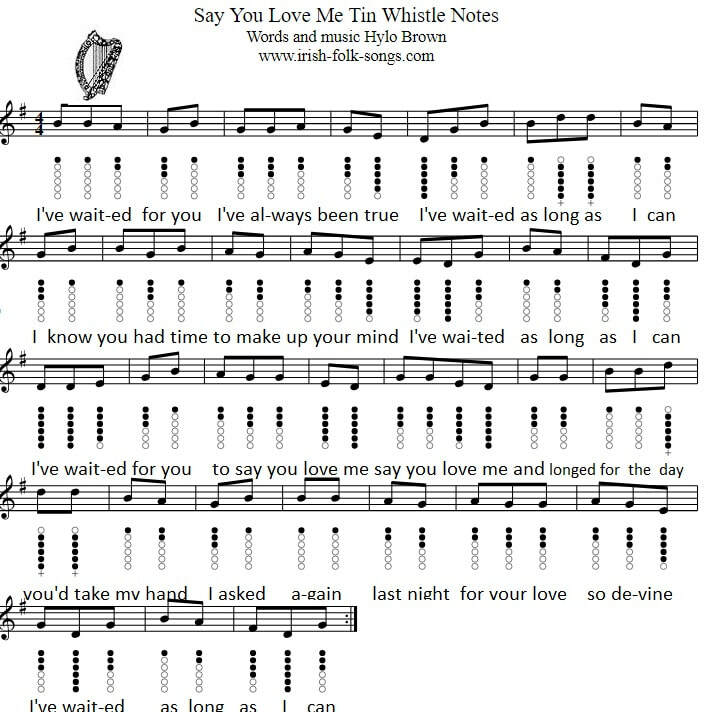 The version of the tin whistle sheet music is more basic than the original sheet music.